In a large, lidded stock pot, add about 2 tablespoons of olive oil and heat to almost a smoking point. Add in as much chicken as will fit comfortably – without crowding – season generously with salt and pepper and brown on all sides. Brown chicken in batches and set aside. Add in the carrot, onion and celery, along with the bay and parsley. Stir and cook for three or four minutes, scraping browned bits off the bottom of the pot. Add chicken back in, and cover all with with about 12 to 16 cups of cold water, season with a bit more salt. Raise heat to high, and bring to a boil. Lower to a simmer and cook for an hour to an hour and a half. Skim off fat from the stock into a small bowl. Set aside. Strain stock, reserving chicken on a plate to cool, but discarding vegetables. Separate and shred the chicken from the bones and skin. Reserve. Return stock to the pot. In a bowl, whisk the eggs, then whisk in the chicken fat and then the slightly cooled chicken stock. Mix in the matzo meal, salt and pepper and mix well. Cover the bowl with plastic wrap and place in the fridge for 30 minutes. Matzo balls double in size, so bear that in mind as you roll these out. A heaping teaspoonful each will make just about that amount. You can get about two dozen from this batch. 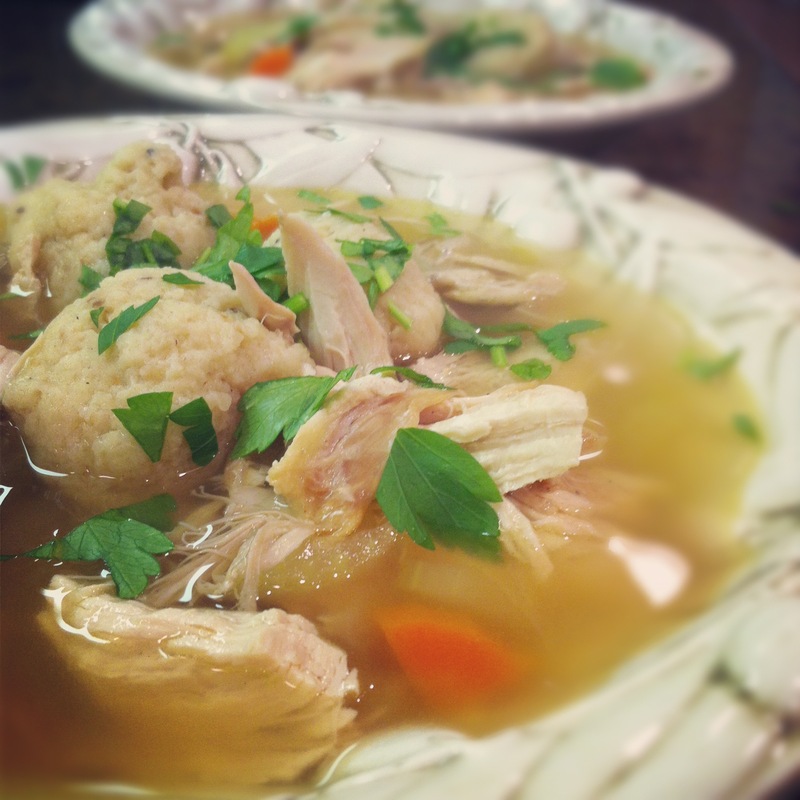 Then drop in your matzo balls into the hot stock. Bring back to a boil, then reduce to a low simmer and cover and cook for about 20 minutes. Remove cover and add back in the shredded chicken. Serve with a garnish of chopped parsley. And an open heart. Playlist included HAIM, Don’t Save Me.